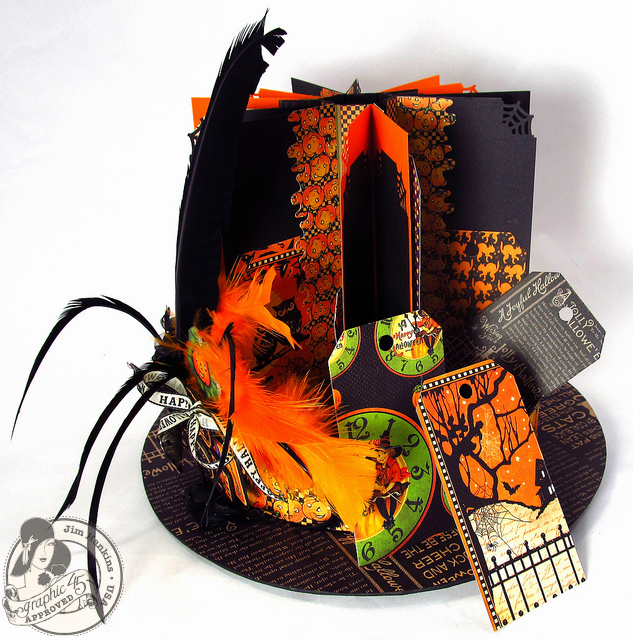 The Gentleman Crafter: Graphic 45 Project Reveal- Haunted Top Hat! 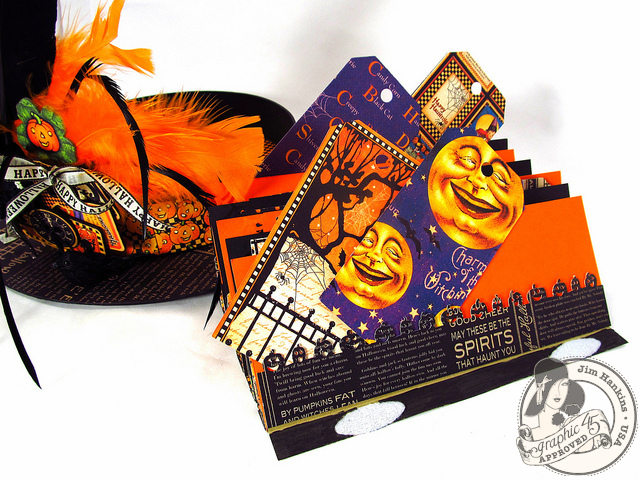 Please join me over at Graphic 45's blog to get a glimpse of my favorite Halloween Project yet...Graphic 45's Happy Haunting Halloween Top Hat! It's been a fun and spooky week over at G45's blog. They are showing all the DT's projects using the adorable Happy Haunting Collection. I decided to throw my hat in the ring and do a Haunted Hat!....OK, so that wasn't as funny as I thought it would be...Forgive...Forgive!!! 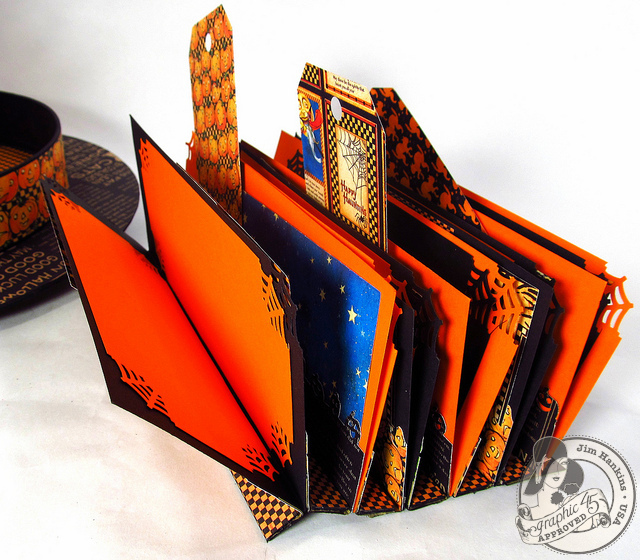 For a video with some of the details on how this was made, please visit Graphic 45's blog. Also check out my very favorite person around...Kristin Wilson of Kristin Wilson Handmade's creation while you are there. Give her some LOVE! I just love this lady y'all! She is totally the sweetest person I have ever met and VERY talented too!! We hung around each other (Let me rephrase that...I hung around Kristin I should say!) at CHA the whole time we were there and truly became life-long friends! Thanks Kristin! Well, that's all I have for ya! Hope you like the Happy Haunting Top Hat! OH wow! You never cease to amaze! My big question is why aren't you wearing it to show it off....just sayin! This is awesome,Jim, way to go!!! I just watched your video over at Graphic 45. Can I just say that your top hat project is amazing! Thanks for the video. I can't wait to make my own! Wow! This is really great, and a surprise mini inside, how neat is that? Oh my gosh Jimbo! This is my favorite Halloween project of yours yet!!! Wozers is this the coolest thing eva! Not only is this hat over the top amazing.... You take the time to make a video and share what you love with everyone else. Which is a talent all on its own. You are such a talented artist. And I'm proud to say also my very dear friend. Hugs to you. Oh and I do believe I was the one tagging along at CHA. Sooooo much fun! Jim, the top hat with the circular mini is so great. 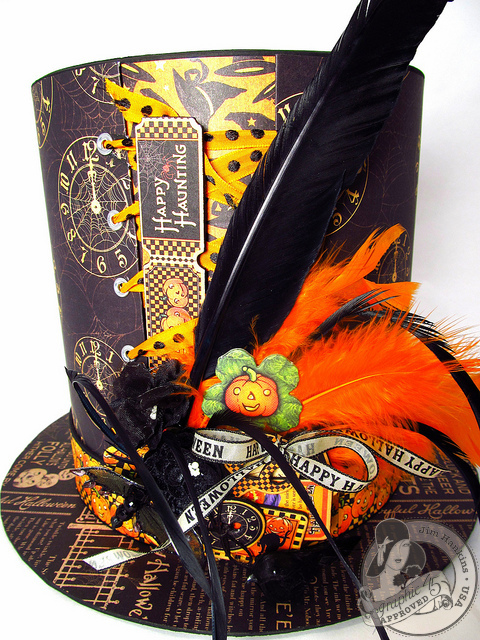 Love how you take an ordinary round box and turn it into something spooktacular! The binding method on the circular mini is so clever. Would you mind sharing how that's done? Great job. Hugs to ya! Fabulous! Love the mini, it turn out great. Hi Jim: I want to know if I can come and live inside your head for about a month and absorb some of your creative brain activity. The HAT is just fantastic. Can you tell me how tall it is and the diameter. I also wanted to tell you that Michael's has paper mache top hats in their seasonal section. But that's for a snowman project I'm doing. I have to make one of these hats you did. Have to buy more Happy Haunting because I used a lot of it doing my latest project. Please visit my blog and see it at www.primitiveseasons.blogspot.com. Thanks again Jim for sharing so generously with your fans. Jim, just saw the video on Graphic 45 blog and it is amazing, you are so talented.Thank you for sharing with us and showing how to make one..
OK - Do you ever sleep???!!! Love your work, and your imagination seems limitless, but I can't fathom that you get any sleep with all of the time you must spend on these fabulous projects!!! Such detail! love, Love, LOVE your stuff!!! In the deep, dark recesses of your mind...lies yet another fantastic project. This one tops them all...what could possibly be next?!?!?!? Can't wait to see. WOW, WOW and WOW! Outstanding! This is amazing. I love what the hat holds inside. Thanks for sharing the how tos! Your creations are just amazing and inspiring! They must take you ages but they are so worth it... I just love it! Jim, your top hat is spectacular! Love the way you decorated it..so cool. Man you are so talented! Fantastic! Love the hat and mini. I don't know how you find the time or have the imagination to come up with all these wonderful projects, but I'm glad you do. Thank you for sharing your creations with us. Wowzers!! 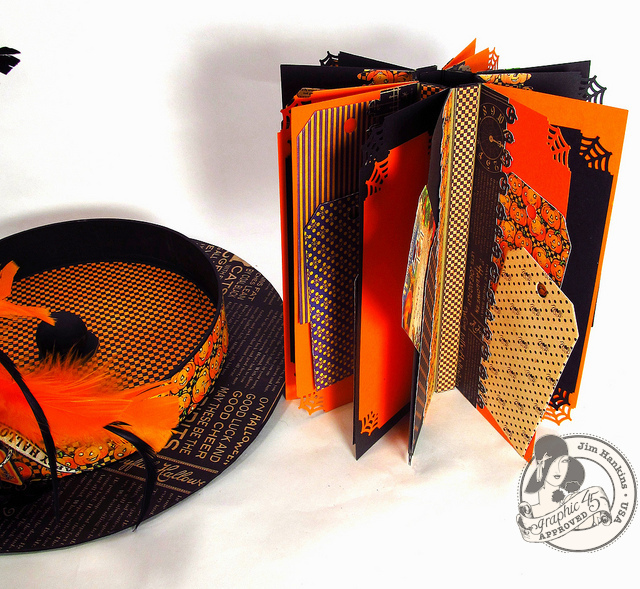 Fantastic project and I love that you put a mini album inside the top hat!! The hat by itself is a cool decoration, but to have the mini is awesome! Very crafty creation!! It's especially nice that you can lay the mini down flat too so it's a flip stand/book. I love, love, love this project. It is wonderful!!! So fun, so colorful, so JIM!!! LOVE it! Jim, it is so you. It is awesome. Love the idea of the circular book in that. Only you could come up with such a great idea. You are sooooooooo talented. Thanks for sharing. WOW, WOW, WOW, Jim this top hat is so Awesome and so you!!! It is incredible the way your mind works, Great Job!!!!! This is so stinking cute. Adding a round mini is so ingenious I just can't hardly stand it. What a great project. There are not enough adjectives available good enough to describe this!!! Oh my gosh...craftgasmic is all I got!!! you continue to rock Sir Jim bril hat, just adore the mini. magnificent and whatever everyone else has said! Oh my goodness...totally blown away with the awesomeness of this top hat!!! It is so you! Love it. This is fabulous Jim! I love the box you used. Made it so much easier I'll bet. Thanks so much for all your great creations. This is adorable Jim. I can't wait to make a Christmas one with an old fashioned lamp post sitting on the brim. Just amazing. You are so darn talented. 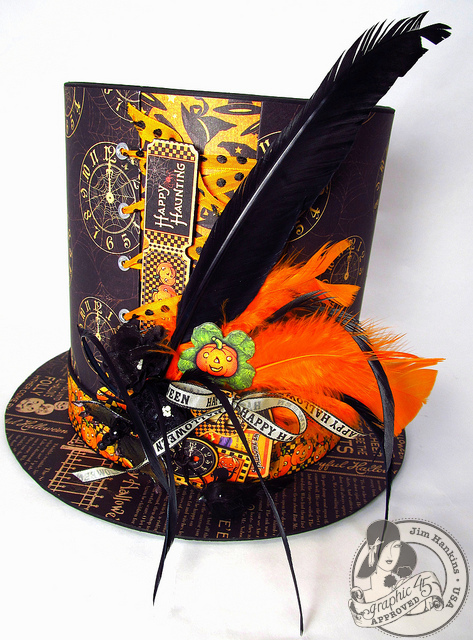 How fitting you chose a Top Hat for your Halloween project. Makes me wonder what you have in the hat you wear on your head??? Hmmmmmm..... inquiring minds wanna know!!!!! Thanks for sharing, I am happy to be a follower. Can't wait to see what you choose to do with the Bird Song paper. I know it is said "Patience is a Virtue". Well my Virtue is on vacation. Counting the days until the 20th. Jim, this is just ADORABLE! Love it! I wonder.....how does it look on you?????? OMG!!!!!!!!!!!!!!!! !every time I think you cannot POSSIBLY top yourself you go right ahead and do JUST THAT!!!!! I AM IN LOVE WITH YOUR HAT!!!!! You are the BEST.....THANK YOU for sharing your talents with the rest of us lowly mortals. I love love love this. You are so talented. Tutorial anyone? Just perfect! Only you could come up with a top hat like this - and I love the circular mini too - how clever! This is over the top(hat) fabulous!!! I altered a witches hat last year and it was soooo much and now I'm looking forward to breaking it out this year! Thank you! I just love the top hat - and the circular mini inside is brilliant!!! 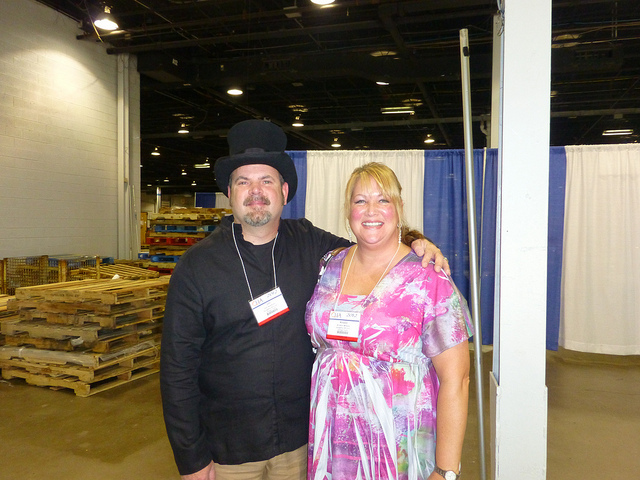 Top hat - perfect! The mini inside is too cool. It could fit into all kinds of round containers. Very well done! Luv,luv,luv it, Jim. This is so you!!!!!!! Clever with a slice of your signature to boot, (or should I say hat). Gotta go check out g45 and your video. oh my gosh! this is really stunning!! 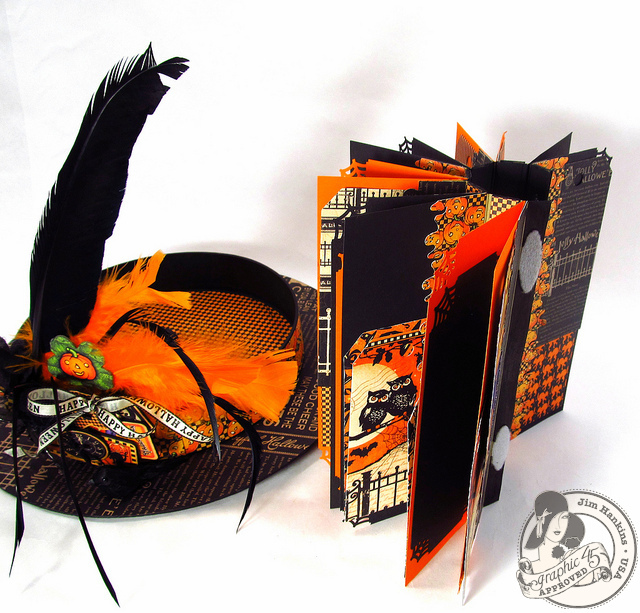 Who would suspect a tophat of having a surprise book inside! Awesome! You roced it again! But then again, I suppose you already know that ;) My SIL is very into Halloween so this will have to be something I do for her. Thanks for the idea! Oh WoW this totally blew me away when I saw it was not just a hat. I never for one minute expected a book inside. Yet again amazing work. You have rocked my Halloween world.Truck driving hubby just looked over my shoulder-you blew him away too.You are the absolute best-thank you for sharing your talent and art with all of us. Love your hat so much I already got the hat form from JoAnn's to make my own. You are such a great inspiration and keep me trying new things. Great top hat! And I was glad to see you started with a pre-made round box... that makes life so much easier for those of us out in craft-land who want one of our very own!